We left Mountain Air and our flight over the giants to head north towards Rotorua, (roto==lake, rua==two; it was the second lake discovered by Ihenga, the Maori discoverer of New Zealand) another volcanic area. We were one and half days into our trip and already at least a half day behind schedule! We followed highway 47 through the small town of Taurewa (==having no settled home), on past Lake Rotoaire(roto==lake, a==of, ira==a persons name), behind which Pihanga (==window; the mountain has an opening on its side) was visible. Then the road descended to Turangi (tu==to stand, rangi==the sky; to stand in the sky, the name of a chief). One of the big public works of the 1950's in New Zealand was the harnessing of the hydro- electric power potential of the waters that flow from the volcanic mountains. 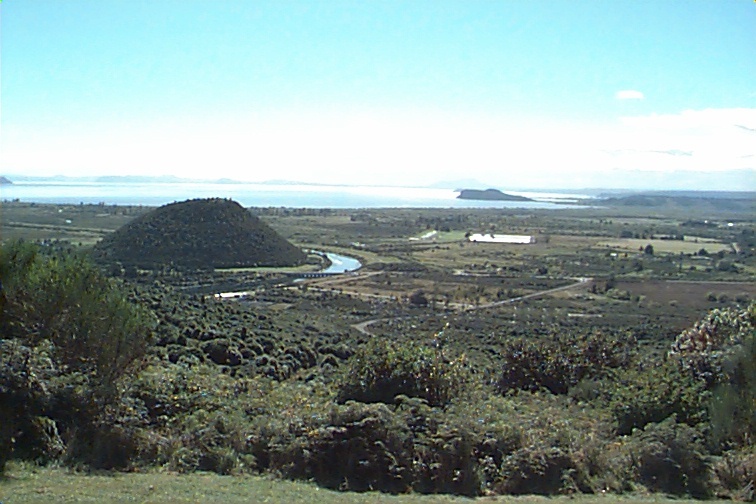 This is done, with a series of canals and tunnels which cumulate, initially, in a flow into lake Taupo (==shoulder cloak; it is a contraction of a longer name that means "the great cloak of Tia"). The canal that flows into Lake Taupo is a short canal that comes from the power plant at the foot of a long tunnel. In this photo we have our first glimpse of Lake Taupo. 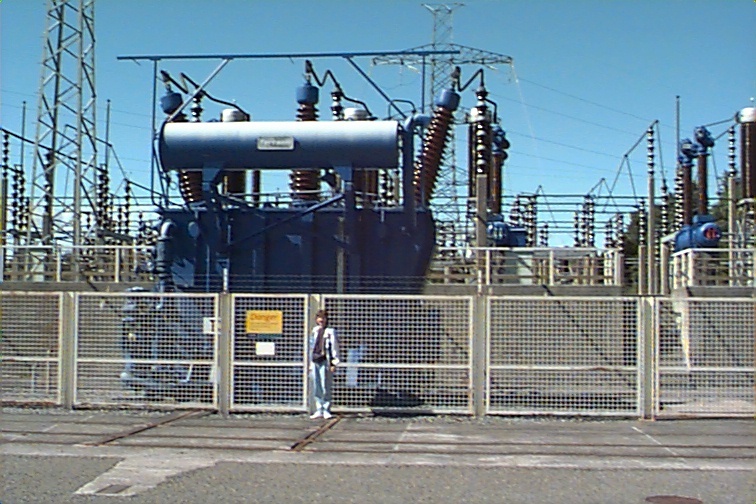 Christine, of course couldn't pass up the chance to visit the generating station and to see its transformers and generators. 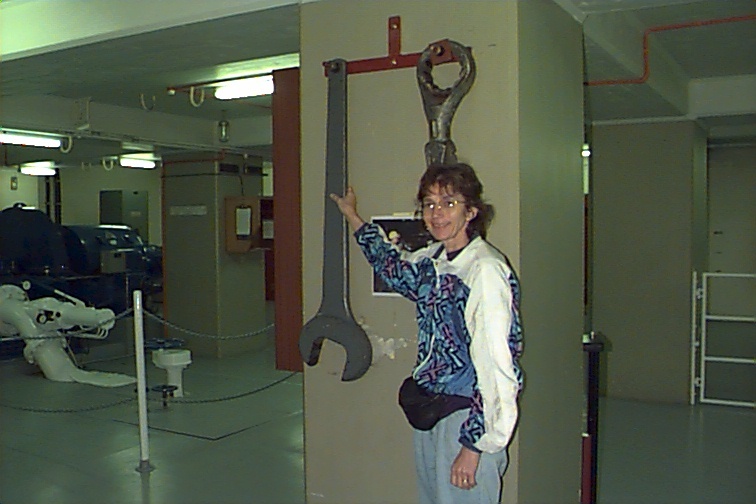 She was impressed by a spanner which she wanted to add to her toolkit. From the power station we went into the town of Turangi to have lunch. As we got of the car Christine heard the pipes. 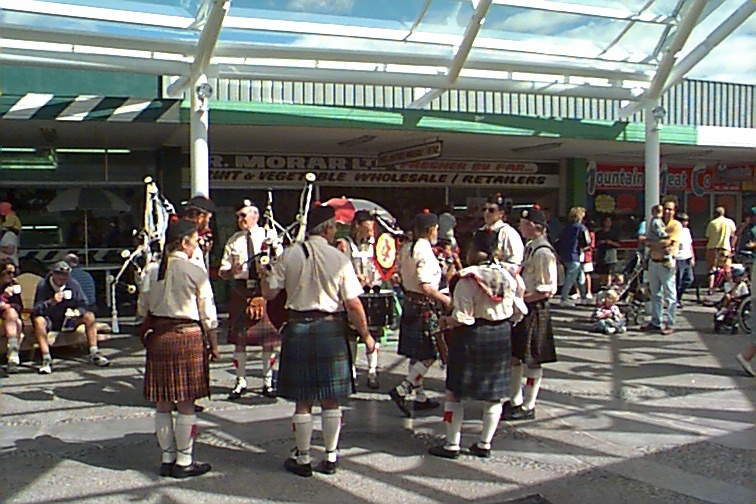 And sure enough, there in the mall was the King County Pipe Band entertaining the shoppers. I was fascinated by one of the pipers penants -- advertising the pharmacy that sponsered him. 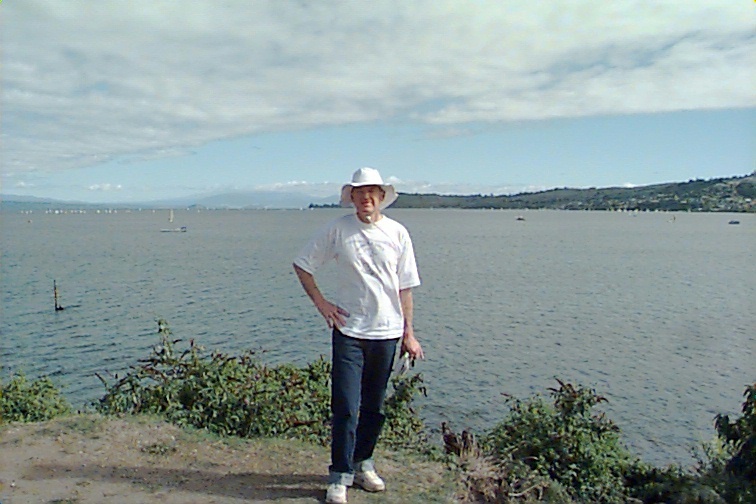 After lunch our next stop was on the banks of Lake Taupo at Motupapa (motu==flat, papa==flat) a small lakeside town where a friend has a boat and camper. Unfortunately (being a day late) we did not meet up with him, however there was time for a photo of Ken beside the lake. The lake reminded us much of Lake George in upstate New York. This image was reinforced as we travelled north along the eastern edge of the lake on highway 1 all the way to the town of Taupo, which reminded us of Lake George village. The town was packed with Easter weekend visitors (this was the 'best' Easter weekend in a few years) and we saw no signs of accomodation. After tea we continued on our way towards the town of Rotoria, continuing on highway 1. 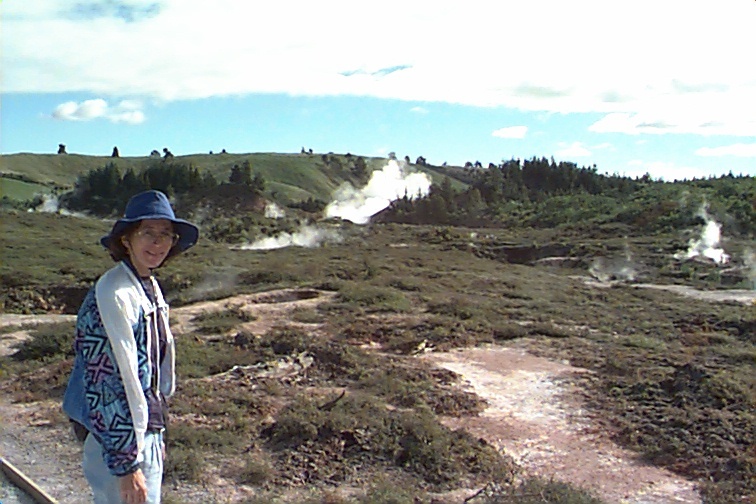 Just out of Taupo, about 5 kilometers is an area called the "Craters of the Moon". This area, which came into existance when a geothermal station was created a few miles away, is essentially a sink hole. But it is a sinkhole with a difference. 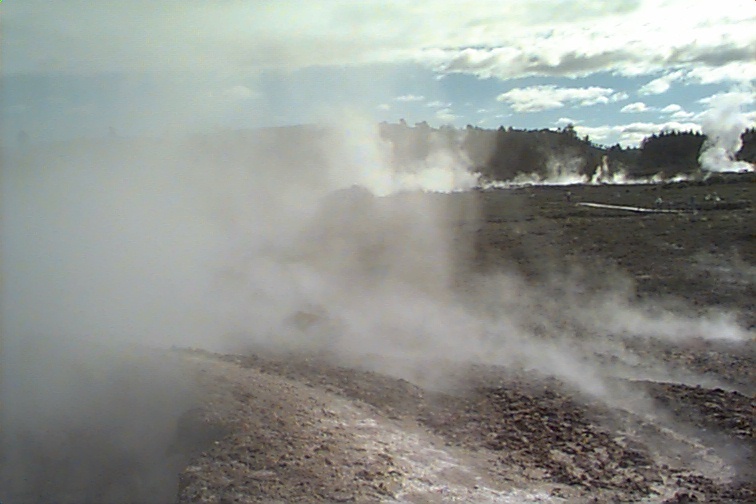 The area has many vents through which steam emerges from the geothermal sources below. We spent an interesting hour walking through this area and took many photos. The first of these shows the evident enjoyment that Christine had with the place (the photographer, in contrast was terrified). 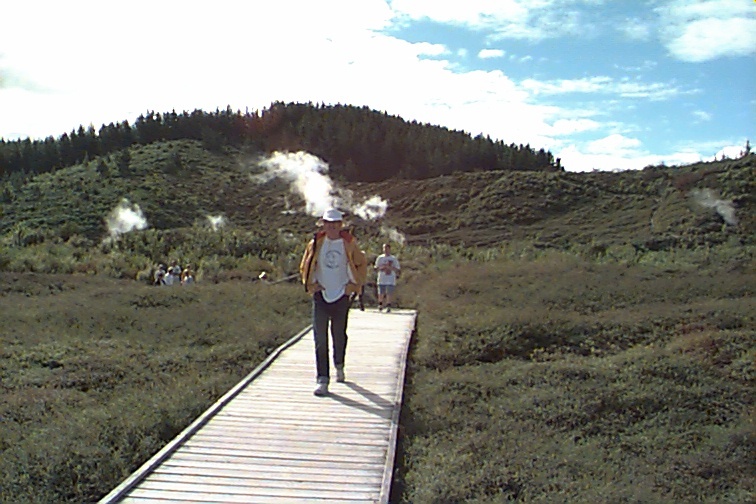 A boardwalk has been constructed through most of the area (presumably to protect visitors agains serious eruptions). Off the boardwalk are quaint signs which read "unstable ground" (perhaps these should have been installed at the arrival gate in Auckland?). 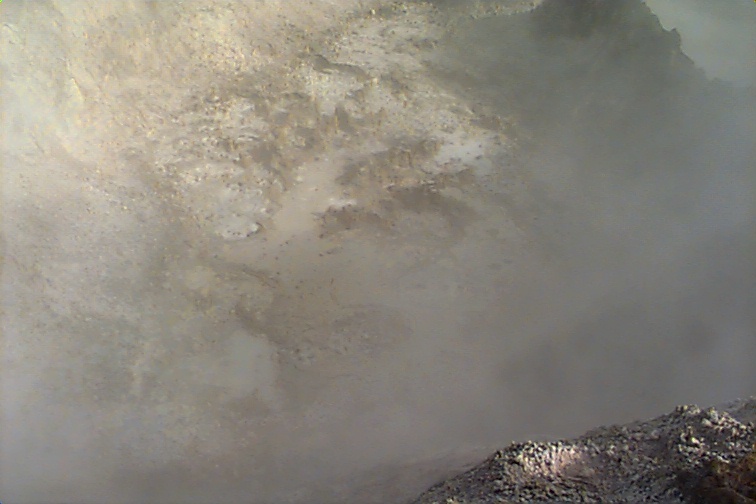 There is, however, something rather impressive about boiling mud and dense steam emerging from the ground. . . . through to image 15!!! From the Craters of the Moon we went a couple of kilometers back towards Taupo and took in the Huka (==foam) Falls on the Waikato (wai==water, kato==to flow) river, the 'drain' of Lake Taupo, which flows to the north. While much is made of the falls, they seemed tame to us -- somewhat comparable to those at Hogs Back in Ottawa and I find that I did not even take a photograph. The next few hours were spent driving. We drove north, leaving Taupo about 3:30 on highway 1 towards Tokoroa (toko==long, roa==pole0, but branched northeast near Atiamuri on highway 30 to Rotoroa. The first half of the drive was through fairly hilly, forested country, while the northeast segment followed a river valley. We arrived in Rotoroa about 5:00 in good time to find a motel for the night -- good luck -- this was Easter weekend, one of the finest in years and there was no available accomodation, even though it seemed that half the town was hotels. Rotoroa is internationally known and highly marketed for its hot mud and water baths. There were many Japanese in evidence -- and they had booked ahead. Rotoroa was the northernmost part of our trip. From there we had to return south, so we decided to head back to Taupo expecting to find a motel on the highway or else to stay in Taupo. So as not to return the way we came we headed southeast and then southwest on highway 5. Of course, there are almost no hotels on highways in New Zealand -- the only one we came to gave a loud roar of laughter when I asked if there were any vacancies. 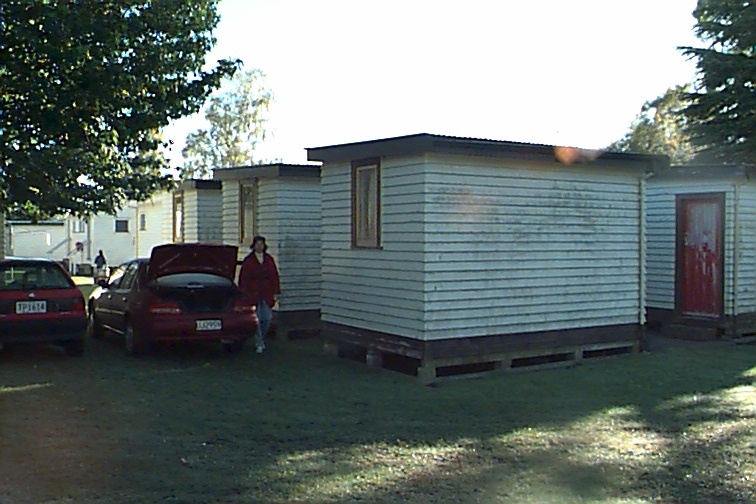 We spent an hour driving around Taupo passing "No Vacancy" signs and then decided to head south, back to Turangi, where earlier in the day I had seen vacancy signs on the motels (all the while calculating how long it would take to get to Wellington and our beds). In Turangi we had success . This 'motel', which remined me of scenes from the "Grapes of Wrath" provided beds which very welcome (at $25 per head). We had a lacklustre meal at the only restaurant we could find (I think they were stressed by the Easter weekend). Christine unfortunately did not sleep all that well. However, the next morning we were off again. Our road was highway 1 south on the eastern edge of our volcanoes towards Waiouru. While in Canada we are used to frost heaves in our roads, here the heaves come from the earthquakes and volcanic eruptions. The drive was through a desert like which does not get the benefit of the heavy rains that fall on the western sides of the volcanoes, but which do benefit from a flow of water generated by the melting snow caps of the volcanoes. It reminded me much of the kind of desert one drives through south of Salt Lake City. We passed through Wiaouru without stopping and pressed on to Taihape -- Gumboot City. 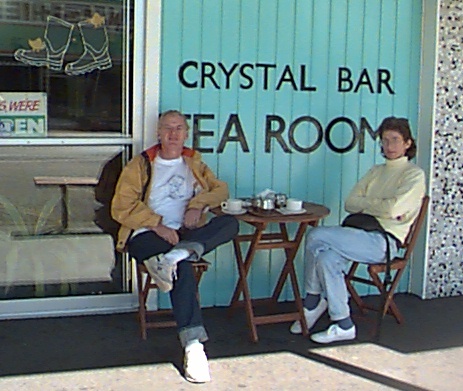 Here we stopped for tea at the Crystal Bar Tea Room which we were assured was one of the oldest tea rooms in New Zealand, having been in continuous use since 1924. The drive from Waiouru to Taihape was a repeat, but in the opposite direction of the trip we had made two days before. Now we set off on new routes. We took the road from Taihape to Napier. This road is not rated a highway number. A third of the 150 kilometers was gravel surface. The road is a very scenic and relatively drivable road. The traffic on it was very light. This page is under development. Correcting comments of those unnamed would be appreciated.